Back in January I did a massive purge of nail polish. I'm pretty sure I removed probably over 300 bottles from my collection. These were colors I no longer used, had similar color of, or just no longer liked. I have these boxes of polishes still waiting around for swaps or to let friends pick from. I recently went through these boxes and discovered a China Glaze one I did not want to part with any longer. I adopted it back into my collection, and I'm happy I did. 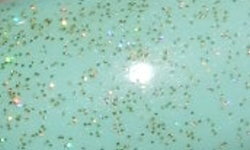 Golden Enchantment is a golden micro holographic glitter topper. Color: This is a gold holo glitter topper! I love that it's gold. There are countless holo glitter toppers that are silver, and it's so nice to have a gold one! Yay for gold! Formula: This is is a smooth and easy to apply formula. I used 1 coat above. You're not going to get much build with this polish, nor will you ever achieve opacity, but that's not the point. This just adds a nice subtle effect. Price: A Google search will find you plenty results for this polish either on eBay or etailers in the $2.50-$7.00 range. Overall: I love this oldie polish. I feel bad I wanted to dump it at one point, but it's here to stay now. I love the effect this golden holo glitter gives on many polishes. This is a great polish to have in your collection. Beautiful combo! And come to think of it, all my glittery toppers are silver too (except maybe for a flake one). This is like the gold version of fairy dust! I have over 200 polishes to get rid of. It's just way too overwhelming to think about doing another blog sale with that many. I'd rather just pass them on to friends. I'm sorry! It looks so delicate and pretty over the base you choose! Funny how it made it's way back into your collection.